Presumably you like the Ch Ampelia. I was impressed when I tried it at the Brighton tasting (though @Inbar and partner were less so) but haven’t opened my '12 bottle yet. Yeah, I think it’s good claret for the money, well-structured but tasty too. I enjoyed the 2012 as well, and now that Pauillac’s out of stock, I’m rearranging my basket to accommodate another bottle or two of this one…! Ah! Yes, I remember. I think I liked its nose more than its taste, but Martin didn’t get on with it at all. To be fair, the (charming!) producer did tell us that the wine needs at least a couple hours decanting to really open up, so it’s likely that we didn’t taste it in all its glory. Yes I remember being particularly impressed by his welcoming and informative presentation. Mind you despite hearing rumours of stuffy Bordeaux producers I found almost all of them very friendly and welcoming. @Herbster if you haven’t already I strongly recommend you try his Chateau Grand Corbin-Despagne Saint-Emilion (same producer). More on topic, I think I’ll have to wait for my first EP order to arrive to get my first OWC. Outside of EP I rarely my more than three bottles of any one wine in any one order. I like the variety. 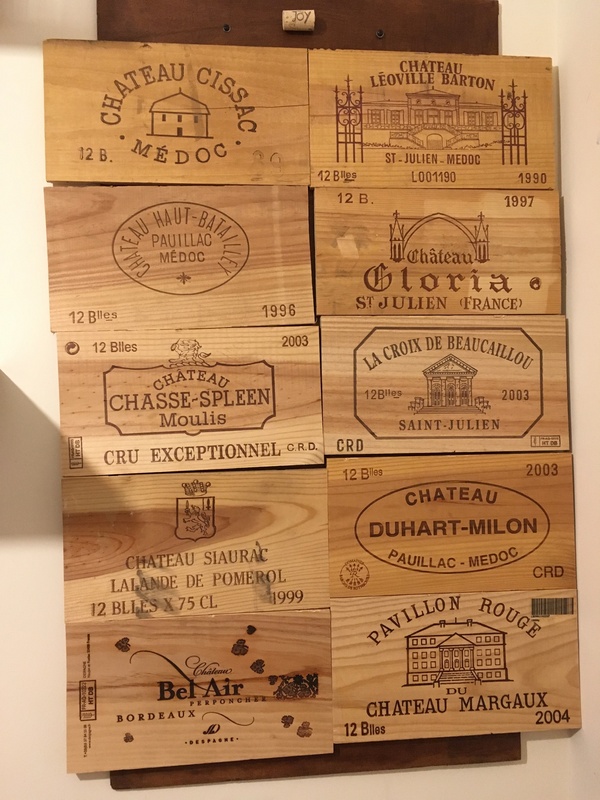 The marketing mind-trick of the wooden case is working its magic on me: my 2014 Sénéjac arrived at the same time as the Ampélia but in a branded cardboard case. Guess which one I’m more excited about opening…? Haven’t tried it yet but I’ll keep an eye out! The Grand Corbin-Despagne is Francois Despagne’s ‘ancestral’ estate but he was really excited and enthusiastic about his ‘new venture’ into Castillon. He was also a bit scathing on the TWS drinking windows. 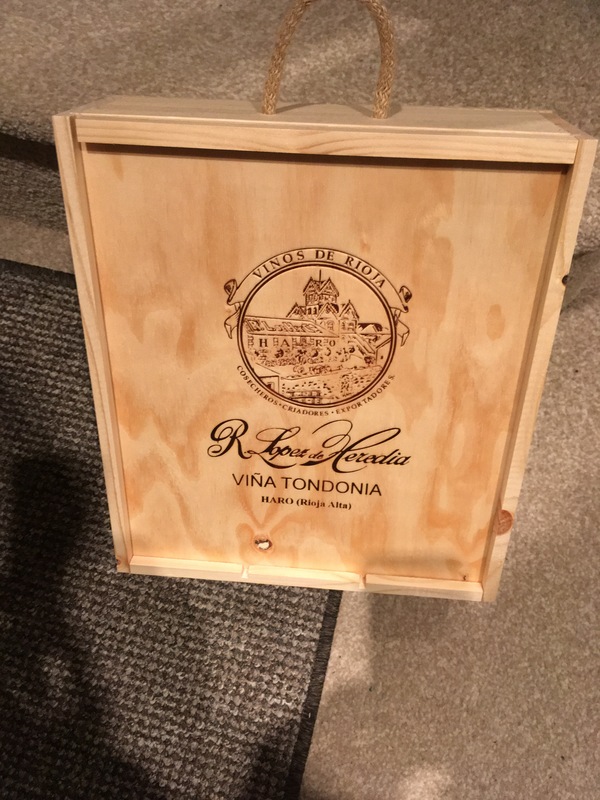 Saying that the ST E wines he was showing which TWS had as “now to…” actually wanted at least another 3 and 7 years each for the '11 and '15 respectively that we tasted. 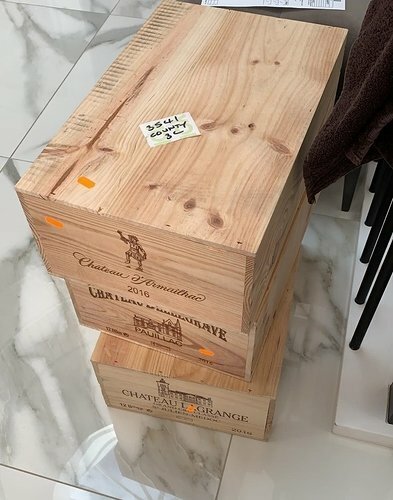 Some of my 2016 Bordeaux EP has arrived today. Aha! A sliding-top box. I’ve got a GC Burgundy (I forget which) that came in one of those. So much more practical. I wonder what other improvements could be made in the OWC? It’s a pretty crude design after all. Maybe dovetail joints on the corners? A single lift-out structure of internal dividers for double-layer OWCs? Ah, these ones were not from TWS. My 2016 Bordeaux EP from TWS are not due to arrive until the summer, and I’ll keep those in member reserves. I bought some Leoville Barton and Leoville Poyferre. I’m hoping they may turn out to be a good investment and if not, I’ll pull them out of reserves and drink them! It’s a win win. I wonder what other improvements could be made in the OWC? 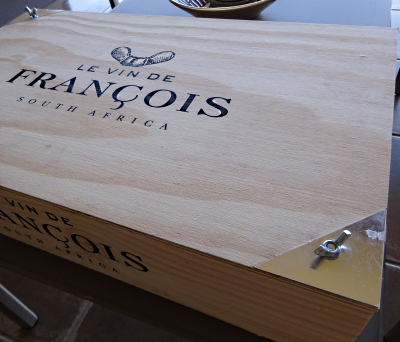 The ability to open it without the need for specialist equipment and without fear of losing a hand would be a good start. I would love to say these are full of wine but they’re not, only CD’s and 7" singles. 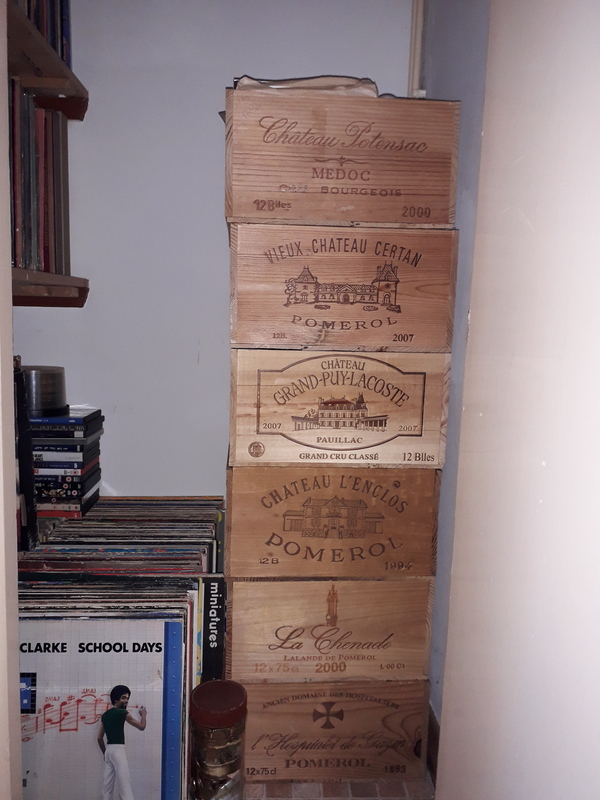 Er, and two of the boxes, the stand-outs, were empties picked up at the Cellar Showroom for a small contribution to charity. If only I had the foresight to realise that Spotify would one day exist. Edit - and another example on my part of compulsive collecting ! Ah, but how do you stack them? How about this. 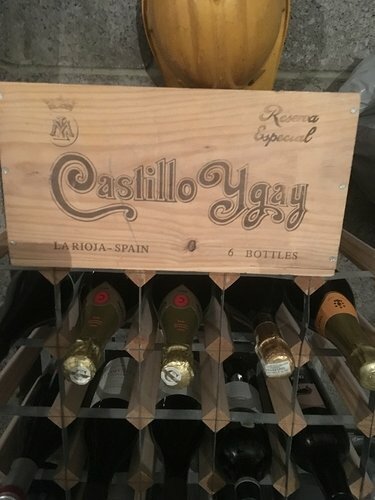 Two holes in the bottom align with wingnuts on box below, and bottles in box leave space. 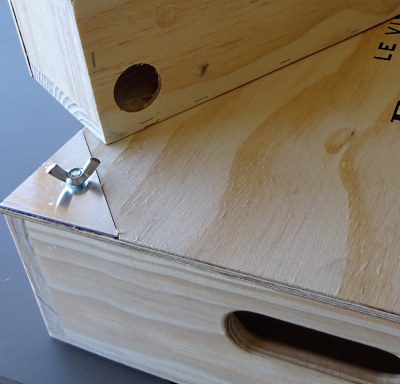 There are also some clear soft pads stuck on the bottom of the boxes so wood doesn’t rest on wood. Wood is solid and good quality with proper joints sand papered smooth. The upper hand holds slope upwards inside for easy handling. We removed the decorated ends and stuck them to a board. Not a great work of art but a nice reminder. 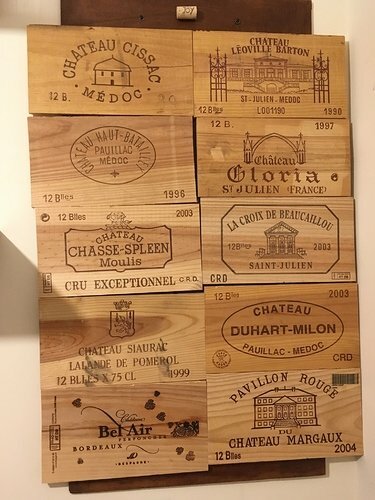 Stuck on the wall in our pantry/wine cellar. LOVE THIS …! Great idea .